The boys had to work hard for their scores today at the Vans US Open of Surfing. Check out the best images from the Junior Men Quarterfinals. The men continued their QS campaigns, facing some challenging waves at the south side of the Huntington Beach Pier. Clean morning conditions for the redemption Round at the main event of the Vans US Open of Surfing. Here are the best photos of the day. It was the Women's Juniors turn to hit the water at Huntington Beach for the first time. Smaller surf but clean conditions at Huntington Beach for the remaining heats of Round 2 of the Men's main event. The girls were ripping at the non-elimination Round in Huntington Beach today, take a look. The men continued to charge at the Vans US Open of Surfing in Huntington Beach. Take a look at today's best pics. It was redemption time for some of the top female surfers in the World today. Check out the best images of the day. Four of the most talented young surfers battled for one spot at the Vans US Open of Surfing Women's CT event. Meah Collins came out on top. 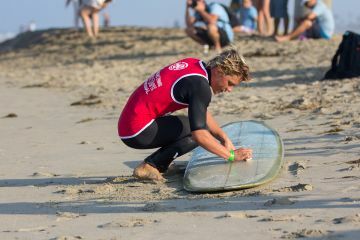 The action continues at the Vans US Open of Surfing as the Juniors hit the water for the first time and the Men's Trials come to a wrap. Check out the surfing action at the opening day of the 2016 Vans US Open of Surfing as the Men's QS Trials kick off the day.